MAGICKALLY INCREASE YOUR BANK AND BUILDING SOCIETY SAVINGS! CANCEL YOUR MONEY DEBTS AND DRIVE AWAY BAD MONEY LUCK! BECOME A WINNER OVER AND OVER AGAIN! Yes! It's true! YOU CAN SOLVE ALL YOUR FINANCIAL WORRIES ONCE AND FOR ALL THROUGH THE AMAZING POWER OF NEW AGE MAGICK! You can receive the money you need! We live in a world of vibration. Poverty, debt, and money worries are a result of poor vibrations. You can now change those vibrations and witness an EXTRAORDINARY CHANGE IN YOUR MONEY LUCK! Now - for the very first time - there is a spell guide that has nothing but practical spells and chants for paying bills and attracting money! Your very own purse or wallet can today become an irresistible magnet for drawing cash to it - even if at present it is empty! And if you have a bank overdraft which seems as if it will never clear you can magickally change this situation for good! MAGICK SPELLS AND CHANTS FOR THE NEW AGE! The magick spells and chants in this new guide are unlike any others you have seen. They are based on age old formulae adapted to modern times. By their very nature you feel these spells will work when you use them. They involve simple everyday items. They can be performed anywhere, even in a small apartment or your place of work! Some of them take only seconds to perform! 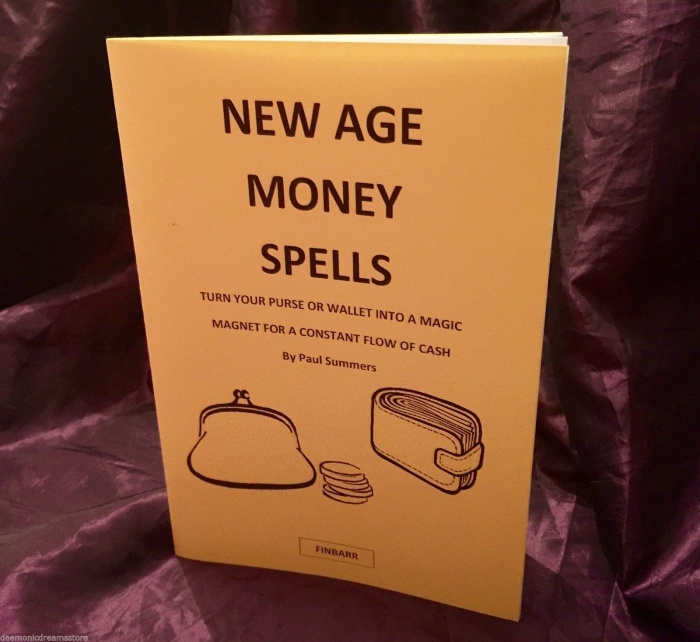 Magick money spells are the personal creation of Britain's #1 spell-maker Paul Summers, who specialises in translating ancient spells into easy, workable formulas for the modern woman or man. Paul's spells are not a rehash of spells from other books: THEY ARE INNOVATIVE AND ORIGINAL - and, more importantly, they work! Paul Summers' credentials are impressive to say the least. He is an astrological consultant for BBC radio and Channel 4; he gives lectures worldwide; is consultant and confidante to celebrities and stars of stage and screen, to lawyers, bankers and entrepreneurs; is handwriting consultant to Sheaffer Pen Textron U.K.; and in his role as graphologist has been enlisted by lawyers for providing evidence in forgery cases. He is a qualified psychotherapist and hypnotist; and in the view of the owner of Finbarr International he is perhaps one of the top 3 Palmistry and Tarot readers in the world. These amazing money spells and chants have been tried and tested by Paul Summers' extensive clientele. These are the actual spells and chants used by his clients to solve financial problems - and bring more money than they could have imagined! W.P. from North London, was homeless. She found temporary accommodation after performing a spell; she found a permanent home - and then won £10,000 at bingo! J.M. (Leeds) performed a money spell - and won a substantial amount on the pools! J.E. (Southall) performed 5 different spells on 5 different occasions - and each time got the result she wanted within 24 hours! The spell guide has no less than twenty different money spells and chants to cover every type of financial need! These chants and spells are geared to the personal needs of readers. The same spell will not work for everyone - that is why Paul Summers gives such a choice. He leaves you to choose the spell or chant with which you feel most comfortable - because it is the spell or chant that you like which is the most likely to succeed for you. This is the only publication to show you how to magickally transmute the negative vibrations which at present stop money from coming to you. IT REVEALS HOW TO WIPE OUT KARMIC FORCES THAT MAY BE OPERATING AGAINST YOU! You can be free of all these things that now stop you from attracting money! * TURN YOUR PEN INTO A MAGICKAL INSTRUMENT. THIS TAKES JUST 5 MINUTES. THEREAFTER WHEN YOU WRITE CHEQUES, OR ENGAGE IN CORRESPONDENCE ABOUT MONEY, YOUR POWER TO ATTRACT MONEY INCREASES. * Use a simple Chinese spell for bringing the SPIRITS OF MONEY into your life. Believe it or not, cash, credit cards, and cheques are all within the psychic sphere of actual 'money spirits'. * BREAK THE POVERTY AURA AROUND YOU. If you are up to your ears in debt, faced with a financial nightmare, then you are shown how a simple spell involving a photo and a bank note can smash these negative vibration - and let money suddenly flow to you from unexpected sources! * MAKE YOUR OWN HOME A MAGNET FOR MONEY. This seems crazy, but simply placing some cash under your doormat has the effect of bringing money into your home. Details in the spell guide. * MAKE YOUR SAVINGS GROW. The money you have in your account can be made to grow. The value of stocks and shares can also be influenced by mystic means. These spells and chants open the invisible doors of opportunity. YOU WILL SUDDENLY BEGIN RECEIVING MONEY IN UNEXPECTED WAYS. Money will begin entering your life every day. Paul Summers has the proof of this with his many clients! To end your money worries once and for all...to have on hand a spell for every financial need...to have money coming from unexpected sources send for Paul Summers' spell guide today!